In this paper, a portable transient elastic wave system for measuring the wave velocities of concrete has been described. The measurement technique is based on the measurements of horizontally polarized surface responses due to an impact at the specimen surface. The Portable system is consist of a portable PC, a sampling A/D card (20 MHz), a displacement sensor system, an impact device, and LabVIEW-based software. The developed portable transient elastic wave system can be utilized to measure the in-situ concrete elastic wave velocities and further to evaluate the quality of the concrete structure. Measurements of the elastic wave velocities on both the concrete plate specimen as well as the in-situ concrete structure have demonstrated its potential in the nondestructive evaluation of concrete structure. In the field of nondestructive evaluation of concrete, the ultrasonic wave velocity is usually measured and utilized to predict the strength of concrete [1,2]. In the measurement, two low frequency ultrasonic transducers with relatively large aperture are usually employed. Depending on the in-situ concrete structure geometry, different transducer arrangements were suggested. In addition to the ultrasonic method, various methods based on the point-source/point-receiver technique that utilize transient elastic wave response have been proposed, and several successful applications have been reported [3-7]. In the methods that are based on the transient elastic wave responses, steel ball impact sources and conical PZT displacement sensors are usually adopted. Since the contact area of the conical sensor is very small, it can be regarded as a point sensor. Recently, Wu et al. [8,9] proposed a method for determining the elastic wave velocities of a concrete specimen using transient elastic waves. In this method, the Rayleigh wave velocity is determined based on the cross correlation of the surface responses and the longitudinal wave velocity is determined by measuring the wave-front arrival of the skimming longitudinal wave. The proposed method is based on the measurements of horizontally polarized surface responses, parallel to the surfaced. The longitudinal wave-front can be identified from the surface response directly, and the source to receiver distance in determining the Rayleigh wave velocity is reduced significantly as compared with the method proposed in Reference 8. In the following sections, analysis and discussion of the horizontal components of surface responses of a homogeneous elastic half space due to a steel ball impact are briefed. To apply the transient elastic wave method for measuring in-situ concrete elastic properties, a portable system was developed and described in the following section. Finally, results of the in-situ applications using this portable system in determining the elastic wave velocity of concrete are given. In a homogeneous isotropic half space with density r and Lamè constants l,m, the corresponding longitudinal wave speed is and the transverse wave speed is . Figure 1 shows the coordinates of a half space Z³0 with a unit normal point force of magnitude H(t) (H(t), is the Heaviside time function) applying at the origin. Fig 1: Coordinates of the half space. Figure 2 shows the vertical (red line) and radial (blue line) components of the surface wave signal generated by a steel ball impact at the origin of the half space. The vertical and radial components of surface responses uxH, urH are nondimensionalized according to uxH* = pmruxH, urH*=pmrurH, while the nondimensional time is t*=Crt/r and r is the radialcoordinate. In the figure, the arrivals of the longitudinal wave (P), transverse wave (S) and Rayleigh wave (R) are marked. As compared with the rest of the signal, the amplitude of the vertical component (along z-direction) of the longitudinal wave-front arrival is relatively small. In contrast to the vertical component, the horizontal component (blue line) of the longitudinal wave gives a much clear displacement jump at the wave-front arrival. In addition, the Rayleigh wave arrival induces a sharp corner and can be identified easily. Figure 3 is the re-plot of Figure 2 with an enlarged vertical scale to reveal the amplitude of the longitudinal wave-front. From this re-plot, it is clear that the amplitude of the horizontal component is about four times larger than that of the vertical component. Fig 2: Surface response of a steel ball impact. Fig 3: The re-plot of figure 2 with enlarged vertical scale. In the measurement of Rayleigh wave velocity using the transient elastic wave, the relative positions of an impact source and two receivers (S1 and S2) are shown in the sub-plot of Figure 4. The distance between the source and the first receiver S1 is r1, and the distance between the first and second receiver S2 is d. In order to utilize the cross correlation method to determine the Rayleigh wave transit time between the first receiver and the second receiver, it is required that the distance r1 must be large enough to ensure that the Rayleigh wave carries most of the energy. The signals shown in Figure 4 are the numerical simulations of the horizontal components of the surface responses recorded at receiver S1 (lower trace) and S2 (upper trace). A half sin3/2t force-time function is utilized in the simulation. The dimensionless impact duration is Tc*, while r1=d. The relative amplitude of the surface response at receiver S2 in Figure 4 has been multiplied by a factor of 1.5. On employing the cross correlation method for the two signals, the time difference of these two signals can be obtained and thus the Rayleigh wave velocity can be determined. Figure 5 shows the influence of r1 (varies from 0.1d to 2d at an interval of 0.1d) on the Rayleigh wave velocity measurements. The horizontal axis is nondimensionalized with the exact Rayleigh wave velocity CR and the impact duration Tc, i.e., and the vertical axis is the ratio of the calculated and the exact Rayleigh wave velocity. The results in Figure 5 show that the calculated Rayleigh wave velocities are almost equal (within an error of 1%) to the exact Rayleigh wave velocity as the nondimensional distance between the source and the first receiver is greater than 0.5. Based on the study in Reference 9, it is realized that the use of horizontal components of surface responses to determine the Rayleigh wave velocity can effectively reduce the distance between the source and the first receiver significantly. The difference between a concrete half space and a concrete plate is the appearance of one extra rebounding surface in the latter case. Since a reflected longitudinal wave may arrive earlier than the Rayleigh surface wave (when the source to receiver distance is larger than the thickness of the plate), a variation on the calculated Rayleigh velocity is expected. Analyses made by Wu and Fang  also showed that so far as the nondimensional distance r1* is smaller than a certain value, the influence of the reflected longitudinal wave on the determination of the Rayleigh wave velocity using the cross correlation method is small. And this shows that the method of determining Rayleigh wave velocity can also be applied to a plate specimen with reasonable accuracy. Fig 4: The surface responses recorded by S1 and S2. Fig 5: The influence of r1 on the Rayleigh wave velocity measurements. Based on the principle of the transient elastic wave method presented in the previous section, a portable system for measuring elastic wave velocities of concrete was developed. The system (Figure 6) is composed of a portable personal computer, a sampling A/D card, a displacement sensor system (include two horizontal polarized conical transducers), an impact device, and the LabVIEW software. Fig 6: The components of the portable transient elastic wave system. In the system, instead of using the digital oscilloscope, we utilized an A/D card with sampling rate 20MSPS and a portable personal computer. The advantage of using this portable arrangement is that it can be used to inspect the in-situ concrete structure. Furthermore, with such an arrangement, the acquired elastic wave signals can be processed immediately with the application of LabVIEW and/or other compatible software. Although, the sampling rate of the current set-up (20 MHz with two channels) is lower than the conventional digital oscilloscope, it is high enough for the use in concrete inspection. The function of the A/D card is to convert the acquired analog signals to the digital ones and transferring the data to the personal computer. The discretized digital signal, however, is no more a continuous one in time domain. The degree of distortion depends on the frequency components of the signal and the sampling rate of the A/D card. In this system, the sampling rateis high enough for the time resolution. In the displacement sensor system, two home-made horizontally polarized conical transducers are mounted with a separation of 10 cm. To avoid the amplification of unwanted noise through the signal cable, in each of the displacement transducer, a pre-amplifier circuit is embedded in the transducer fixture. 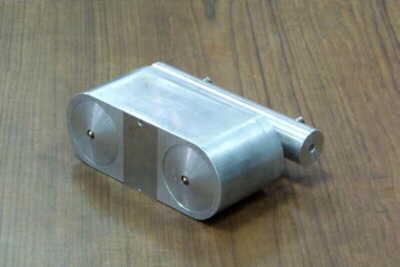 The impact device is composed of a 4.75mm steel ball that is welded on a thin steel bar and position locating device. This impacting device can produce a point source with approximately a half sine force time function. Although the preamplifier of the transducer has been placed as closely as possible to the sensor, certain amounts of high frequency noises are inevitable in general. The presence of the ambient noises on the transient elastic wave signals would lower the accuracy in determining the arrival time of the longitudinal wave-front. To improve the accuracy of measurement, the linear phase finite impulse filter were incorporated in the system to filter out the high frequency noise. Shown in Figure (7) is the photo picture of the displacement sensor system. Fig 7: Photo picture of the displacement sensor system. 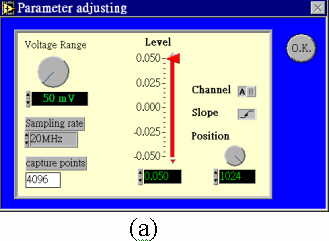 Figure 8(a) shows the parameter panel for adjusting the parameters such as the triggering level, the recorded length etc. Figure 8(b) shows the panel for measuring the longitudinal wave velocity. The upper part is the surface transverse displacement signal received by the transducers. On adjusting the tuner, the cutoff frequency of the filters can be selected. The filtered signals are then appeared in the lower region of the panel. To judge the accurate arrival time, the panel operation tools can be used to magnify the signals near by the arrival of the wave-front. Shown in Figure 8(c) is the operation panel for measuring the Rayleigh wave velocity. The upper region is the transverse displacement signals received by the two transducers. To prevent the boundary reflected signals from disturbing the original signals, the cursor tools can be used to select the necessary parts. With the aid of the cross correlation program embedded in the system, the delay time of the Rayleigh wave can be obtained automatically. Fig 8: (a)The parameter adjusting panel (b) the panel for longitudinal wave velocity measurement (c) the panel for Rayleigh wave velocity measurement. The portable transient elastic wave system was applied to measure the elastic wave velocities of in-situ concrete elastic properties. A high-performance concrete with dimensions 58cm×58cm×13cm was utilized as a testing sample in this study. Figure 9(a) shows the transverse displacement signals of one of the concrete plate surfaces. The arrival times of the skimming longitudinal waves are denoted in the figure by arrows. To enhance the resolution of determining the wave-front arrivals, the finite impulse filter was used to obtain the result shown in Figure 9(b). Fig 9: (a)The parameter adjusting panel (b) the panel for longitudinal wave velocity measurement (c) the panel for Rayleigh wave velocity measurement. Figure 10(a) shows the transverse displacement signals of the concrete surface with a longer recorded length. The result of the cross correlation of these two signals is shown in Figure 10(b). The time corresponding to the maximum amplitude is the delay of the two successive surface responses. With the Rayleigh and the longitudinal wave velocities measured, the transverse wave velocity of the concrete specimen can be obtained by solving the Rayleigh wave equation. In this study, we measured the elastic wave velocities on both surfaces of the concrete plate. Since the coarse aggregates are generally concentrated more around the bottom surface of a concrete plate, the local elastic wave velocities are higher than the upper surface of the plate. The results of the upper surface are CL =4459m/s, CT =2730m/s and those of the bottom surface are CL =4643m/s, Cr =2769m/s. Fig 10: (a)The transverse displacement signals of the surfaces, (b) the result of the cross correlation. A series of standard cylindrical test specimens were also fabricated and tested. Standard compression test was adopted to determine the compression strength of the concrete specimens. Before the compression test, the longitudinal wave velocity of the specimen was measured with the portable transient elastic wave system. Shown in Figure 11 is the obtained relation between the wave velocity and the compression strength. These preliminary results show a good correlation between the concrete strength and the P wave velocity measured. Fig 11: The relation between the P wave velocity and the compression strength. Due to the difficulty in controlling the impact force and determining the starting time of the impact, the averaging method, which is commonly adopted in ultrasonics to improve the signal to noise ratio, cannot be applied when the aforementioned hand held impactor is used. Recently, the authors and their co-worker proposed a piezoelectric impact hammer, Figure 12, for applications in the nondestructive evaluation of concrete structures . In the piezo-hammer, to obtain accurate time reference of the impact, a tiny piezoelectric sensor is embedded in the flying head of the impact hammer to detect the impact signal. A gating-circuit is used to gate the impact signal and send a synchronous pulse as the trigger time reference. With the on-line sensor, the resolution of the impact time reference can be controlled in the sub-microsecond range. Measurement results show that the precision of the wave velocity measurement can be enhanced significantly through the signal averaging. In addition, the electrical driven piezoelectric hammer may find application in the automation of impact-Echo related techniques. Fig 12: Photo picture and design of piezoelectric impact hammer. A portable transient elastic wave system for measuring the wave velocities of concrete has been described in this paper. The measurement technique is based on the measurements of horizontally polarized surface responses due to an impact on the concrete specimen surface. On combining a portable personal computer, a sampling A/D card, a displacement sensor system, an impact device, and the LabVIEW-based software, the developed portable transient elastic wave system can be utilized to measure the in-situ concrete elastic wave velocities and further to evaluate the quality of the concrete structure. Measurements of the elastic wave velocities on both the concrete plate specimen as well as the in-situ concrete structure have demonstrated the great potential of the present portable system in the nondestructive evaluation of concrete structure. The authors thank the continuous financial supports of this research from the National Science Council and the Bureau of Construction of the Department of Interior of ROC. "Standard Test Method for Pulse Velocity Through Concrete," ASTMC597-71 (1979). Ahmed E. Ben-Zeitun, "Use of Pulse Velocity to Predict Compressive Strength of Concrete," International Journal of Cement Composites and Light Weight Concrete, 8, No. 1, 51-59 (1986). N.J. Carino, M. Sansalone, and N.N. Hsu, "A Point Source-Point Receiver Pulse-Echo Technique for Flaw Detection in Concrete," ACI Journal, proceeding, 83, 199-208 (1986). N.J. Carino and M. Sansalone, "Detection of Voids in Grouted Ducts Using the Impact-Echo Method," ACI Materials Journal, 89, (3), 296-303 (1992). K.Y. Kim, W. Sachse, and A.G. Every, "On the Determination of Sound Speeds in Cubic Crystals and Isotropic Media Using a Broad Band Ultrasonic Point-Source/Point-Receiver Method," J. Acoust. Soc. Am., 93, 1393-1406 (1993). J.-F. Chai. and T.-T. Wu "Determinations of Anisotropic Elastic Constants Using Laser Generated Surface Waves," J. Acoust. Soc. Am., 95 (6), 3232-3241 (1994). T.-T. Wu, J.-S. Fang and P.-L. Liu "Detection of the Depth of a Surface-Breaking Crack Using Transient Elastic Waves," J. Acoust. Soc. Am., 97 (3), 1678-1686 (1995). T.-T. Wu, J.-S. Fang, G.-Y. Liu and M.-K. Kuo "Determination of Elastic Constants of a Concrete Specimen Using Transient Elastic Waves," J. Acoust. Soc. Am., 98 (4), 2142-2148 (1995). T.-T. Wu and J.-S. Fang "A New Method for Measuring Concrete Elastic Constants Using Horizontally Polarized Conical Transducers," J. Acoust. Soc. Am., 101 (1) (1997) 330-336. J.-H. Tong, T.-T. Wu and Lee, C.-K. (2000)"Application of a piezoelectric impact hammer to the in-situ nondestructive evaluation of concrete," submitted.